The Kildare Maze Activity Park is located in Ballinafagh, Prosperous, Naas, Co. Kildare and is a great family fun day out. Leinster’s largest hedge maze is a fabulous attraction and at Kildare Maze Activity Park they focused on providing a challenging and exciting day out with good old fashioned fun for families at an affordable price. Out in the fresh air,this is a great place for families to enjoy a day together. The amenity consists of The Hedge Maze and grass paths where the object is to find ones way to the centre of the maze which is in the shape of a St Brigids Cross. It covers approximately 1 acre with more than 1.5 miles of paths, with hedges over 6 feet high. There is The Wooden Maze which is aimed at younger children, this all weather Maze makes an equally challenging adventure for all who dare to enter. The the younger ones can enjoy the multiple play units or just spend the afternoon in the sand pit. 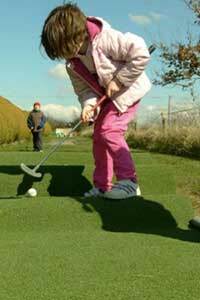 The 9 hole crazy golf at Kildare Maze will have you in stitches which has the ability to delight and infuriate in equal measure . 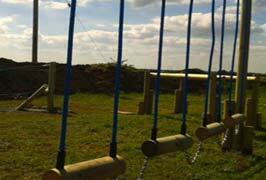 Test your skill and balance on the adventure trail. Can you make it around the course without making a mistake? Or just enjoy the thrill of the zip wire. 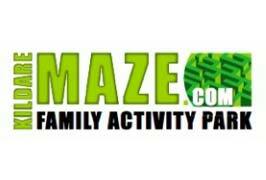 The KIldare Maze offers a great day out for school tours, birthday parties or other family outings. Don’t forget to pack a picnic because you’ll need to take a well earned break from all the fun and excitement! Group rate (10 +): €6 each. The perfect location for you Annual School Tour and what better way for children to enjoy their special day. With hours of outdoor fun at the Kildare Maze Activity Park, you can be guaranteed that a day will be a day to remember! Fresh air, drama and excitement all go to create a day that challenges both the body and the mind and with sharpened appetites an outdoor or indoor picnic guarantees not a morsel will be left in their lunchboxes! Now taking bookings for School Tours and groups. 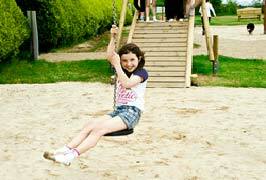 Contact Kildare Maze Activity Park Tel +353 86 851 9296 for more information on your School Tour. The Kildare Maze Activity Park is the perfect location for a family party or child Birthday party with their friends and classmates, there’s are activities for everyone. Sit back relax and watch your children enjoying physical and mental activities. They can cater for that special party with groups of six and over. Special catering arrangements can be organised in advance with their dedicated party menu. Children can enjoy the Easter Egg Hunt in the Kildare Maze and might even find the Easter Bunny. Come to the Kildare Maze and have freaky fun on their Halloween Hunt in the Hedge Maze, but watch out for the Wicked Witches! Spot prizes for best creepy costumes. Pumpkin carving is included in the admission price! Family Fun Tip:- Please note that they have a limited number of pumpkins per day (50) and they will be on a first come, first served basis. There is no Christmas event this year. 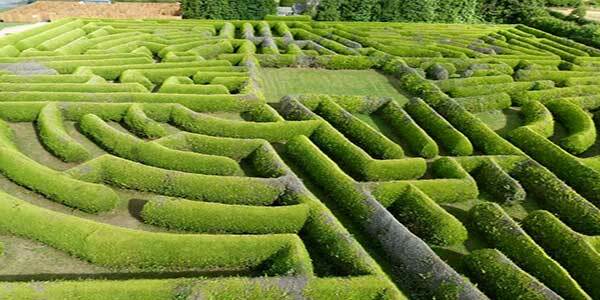 Leinster’s largest hedge maze is a fabulous attraction located just outside Prosperous in the North Kildare countryside. Located 1Km north of Prosperous, enter ‘Kildare Maze’ into Google Maps for detailed directions. (15 minutes from J9 & J10 on N7 and J7 on N4).